I am often asked the significance of the sculpture honoring my 3rd great grandfather, Manuel Lorenzo Trujillo, gracing the entrance to the historic Agua Mansa Cemetery in Colton, California. Here’s how a small thought became a family icon. Visiting the Agua Mansa Cemetery I was well aware there was no grave stone or marker to recognize the final resting place of the patriarch of our family. Lorenzo Trujillo was born to an Indigenous Genizaro father, Juan Estevan Trujillo, and a Mestiza mother, Juana Martin, in the Pueblo of Abiquiu, New Mexico August 9 1794. In his mid 40’s in the year 1840 Lorenzo Trujillo, his wife Maria Dolores Archuleta & their seven (7) children permanently left their Abiquiu, New Mexico homeland traveling/walking the 1200 mile Old Spanish Trail to settle in the San Bernardino Valley of Alta California. Lorenzo was recognized as a founder and leader of the San Salvador-Agua Mansa communities. He died April 4, 1855 and was one of the earliest burials at the newly established Agua Mansa Cemetery. Honoring a person of such personal and public importance would prove challenging. A mere headstone would be insufficient and out of the question. Through conversation I learned of a sculptor artist living in Los Angeles, California, named Simi Dabah. Mr. Dabah reportedly only donates his artwork to public, non profit institutions. I searched Mr. Dabah’s website and was totally captured by his creations. By luck or destiny the barber who cuts Mr. Dabah’s hair just happens to be my partner. I was told Mr. Dabah had an upcoming appointment at 9:00 am just two days in advance. I promptly composed a letter explaining a brief history of Lorenzo Trujillo and requested a sculpture donation to be placed at Agua Mansa Cemetery. A mere two (2) hours after my request was handed to him, Mr. Dabah personally called me and approved my request for a sculpture. An appointment was made to visit Mr. Dabah’s worksite in the desert expanse of Yucca Valley, California. Meeting the artist at his worksite was exceptional. The artist collects discarded metal and works his creative magic in the desert environment. At the worksite there were literally hundreds of art sculptures standing majestic in a fenced five (5) acre plot. The artist explained his work and to my utter amazement he directed me to choose any art piece I desired. How could a possibly settle on one sculpture with endless choices? Walking amongst the maze of art took time. I did sense gravity from one piece that continued to catch my eye. It stood on the sandy desert soil approximately eight (8) feet high and eight (8) feet in diameter and possessed eight (8) extensions. Would this be the one? The core was symmetric as in the eye of a hurricane bringing the family unit into one while simultaneously distributing energy East, West, North and South. Yes, Lorenzo was the center of our known family. One of expanding arms of the sculpture represented Lorenzo’s wife Maria Dolores Archuleta while the additional arms represented their seven (7) children, … Teodoro, Matilde, Esquipula, Gertrudis, Doroteo, Julian and Rosario to complete their New Mexico Trujillo nuclear family unit. It was as if this sculpture reached out, embraced me and announced … your search is over. Having made a decision, I next needed the logistics for transporting the sculpture 100 miles to Colton, California, laying a cement foundation to mount the sculpture and obtaining required permission from the San Bernardino County Museum and County of San Bernardino. Our extended Trujillo family came together and donated the funds for transportation and for pouring the cement foundation. 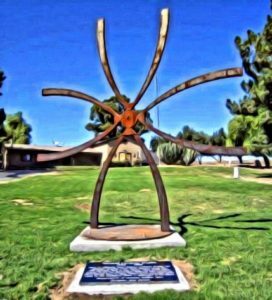 Remarkably, without hesitation the County of San Bernardino approved our request to place the sculpture inside the Agua Mansa Cemetery grounds. On October 28, 2011 the sculpture was dedicated, with the blessing approved by the Bishop of the Diocese of San Bernardino, California before the attendance of 100 friends & family. The Lorenzo sculpture has since become a Trujillo family icon. Today, the image of the Lorenzo sculpture graces gold pendants, wool woven rugs from his native New Mexico, clothing as well as becoming the logo for the Spanish Town Heritage Foundation. With satisfaction I urge everyone to continue searching your families history as you never know when that small thought or idea can bloom into lasting family history.